West Choir performed just after the tree was lit on Friday. Members of the community packed the lobby of the Scioto County Courthouse on Friday for the Annual Christmas Tree Lighting Ceremony. Kicking off at noon, the ceremony began with welcome and prayer by Scioto County Commissioner Bryan Davis, followed by a musical performance by the Portsmouth West Choir under the direction of Linda Tieman. The Scioto County Commissioners recognized staff and department heads, and the countdown and lighting of the tree was conducted by V.I.P participants Robert McGlone and Daniel Whitaker. McGlone also had the honor last year of conducting the countdown for the first ever tree lighting. Another performance was given by the Portsmouth West Choir, before all those present joined in for a sing-a-long version of holiday classic “We Wish You A Merry Christmas”. The ceremony was closed with a prayer by Bryan Davis, and a round of applause for the West Choir. At the conclusion of the ceremony those in attendance were invited to partake in cookies and refreshments of coffee and hot chocolate. 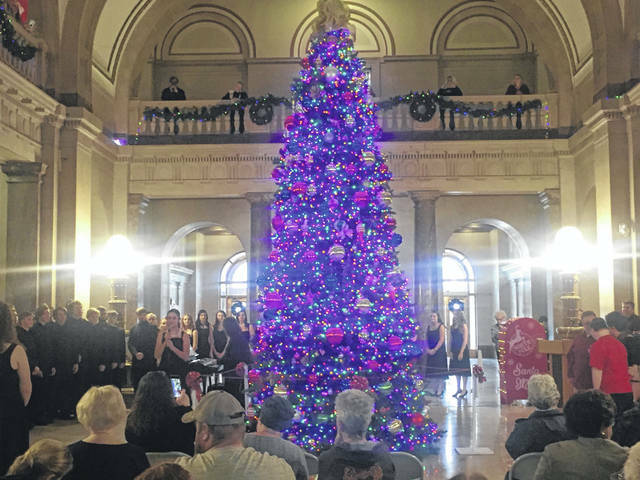 https://www.portsmouth-dailytimes.com/wp-content/uploads/sites/28/2018/11/web1_TreeLight_ne2018113015933823.jpgWest Choir performed just after the tree was lit on Friday.